We know you love your Mini Cooper and you want to make sure that your Mini gets the best of care when it needs service or repairs. Our clients sometimes have questions about their Mini Cooper regarding repairs or necessary service. Please feel free to ask us any question about your Mini Cooper online by clicking here or just give us a call. We know that our clients appreciate getting correct and accurate answers, therefore we do not normally quote prices over the phone or via e-mail; it’s just impossible for us to give accurate information without having our technician take a look at your vehicle and determine exactly what services or repairs are needed. We stay up to date on the latest factory bulletins and repair information on your Mini Cooper and utilize sophisticated diagnostic equipment that is specific to your car so that we can diagnose your Mini Cooper correctly and quickly; that saves you time and money. You get peace of mind when you service your Mini Cooper with us because you are protected by our 36 month / 36,000 mile repair warranty (some restrictions do apply, ask for details) and we save you money as well. Our experience has shown that we are on average 30% less that the Dealer for the same repairs on your Mini Cooper but just because we cost less doesn’t mean that you have to sacrifice quality. When you come to Sport Motoring, you and your Mini will get the personal service and attention that you deserve. We look forward to meeting you. 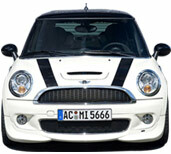 Thats right, we just put it out there, our Mini Cooper oil service is just $69.95. Why, you may ask is the price so low? It’s simple; we don’t want our Mini Cooper customers to feel tempted to go to a fast food joint when what their car craves is bangers and mash. 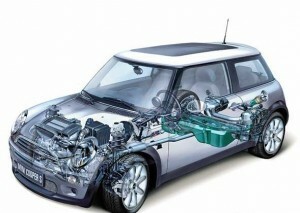 Here you will get your oil serviced by a technician that is experienced with every aspect of your Mini Cooper. We will perform a comprehensive inspection while it is in and give you an update of any conditions that exist or may be upcoming with your Mini Cooper. We’ll even top off your other fluids free of charge. All while you wait in the comfort of our waiting area where you can watch your favorite cable programing or stay productive with our wireless internet. So..you jump in the Mini one day…you start it up and just as you start to drive away it appears…the dreaded check engine light. Not to fear, just come by and see us for a quick check. Usually in a matter of minutes we can tell you whether your light is telling you that you should put your Mini in the shop for immediate attention or whether it can wait until you can make a scheduled appointment. Either way your Mini Cooper does have a complicated electrical system with many control units that communicate with each other. This system requires specialized diagnostic and repair equipment to properly identify and correct the problem with your car, at Sport Motoring we use the same type of sophisticated equipment that the Dealer uses to diagnose and repair your Mini Cooper. The Clutch system of the Mini Cooper is different from many cars and replacing a clutch on a Mini Cooper is the car equivalent to major surgery, requiring major dis-assembly and re-assembly of many systems and components of your car. This is why you want to make sure that you have someone performing this repair that knows their way around all systems of your car. Don’t trust this job to anyone without an abundance of Mini Cooper specific experience.